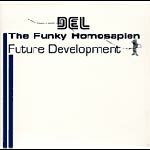 Del's super fresh 3rd album (the one he was supposed to drop on Elektra before they let him go) re-issued on CD for the tape-impaired folks. Essential to any Del fan collection. Includes the bonus cut 'Checkin Out the Rivalry' with Casual, a classic Hiero cut!!! Produced by Del except: 5, 6, 8, 10, 11 A-Plus, 9 Opio, 13 Toure. Pros: This is extremely dope! Del just has one of the nicest styles and the beats are just crazy and funky. Del matures a little more as an MC. Tons of dope production. A lot of replay value. Cons: Don't know if its considered a con buts its a little long... To be honest I didn't even realize that it was a little over an hour. Overall: Damn this album is just too dope! This has to be Del's best solo album (tough I haven't listened to his last two yet), it's really great musically and lyrically. For some reason, when Del raps he just has one of the freshest styles around. The funky beats on here fit perfectly to Del's style; he handles half of the production on here and, hes equally gifted as a producer as he is as an MC. It doesn't sound outdated at all still sounds mad nice. Pretty much raps about friends, love, traveling, and dissing wack MC's. I've been giving this album tons of replay, its really great, and shocked that Elektra never released this album. What do those corporate idiots know about music anyways. In fact this album never saw the light of day on CD till '02 when it was independently released. This is just THAT ONE album that belongs in every hip hop lovers collection. Another late night sipping tasty brews talking with friends. We are reminiscing on prior experience with friends and our laughing at our inside jokes. We start to become more serious discussing social issues, love relationships, political theories. Nights like tonight make me feel happy I'm alive in this world. While chatting with my friends I feel a presence of funky, jazzy, and heavy bass sounds in the background. These complex sounds start to connect and it becomes the most melodic music I have ever heard. Then best of all my friends and I are speaking with rhythm over the music with intricate rhyme schemes that makes me want to shout out praise to each friend that lays down an incredible verse. "This is the greatest night ever", then suddenly the music stops for a moment and I realize I am by myself in my room with headphones on. Then the next track begins and the fun begins again. Genius!